If you’re seeking a dynamic, enthusiastic and progressive organization where you can advance your career, Wieland may be the place for you. If you’re seeking a dynamic, enthusiastic and progressive organization where you can advance your career, Wieland may be the place for you. We are constantly in search of highly-motivated individuals who are natural problem solvers and outstanding communicators. These traits form the nucleus of our DNA at Wieland. High performers who join us tend to stay with us. The average duration of our 11 Shareholders is 18 years. We rigidly screen our applicants and only hire the best. We are generally seeking project managers, superintendents and accounting professionals in or near our office locations in Michigan, Florida, Louisiana, Texas and California. If you are looking for “just a job,” you need not apply. However, if you are seeking a career with a firm that has a rich history and an aggressive growth plan, apply online today! Wieland is highly motivated to attract, grow, and retain great talent. 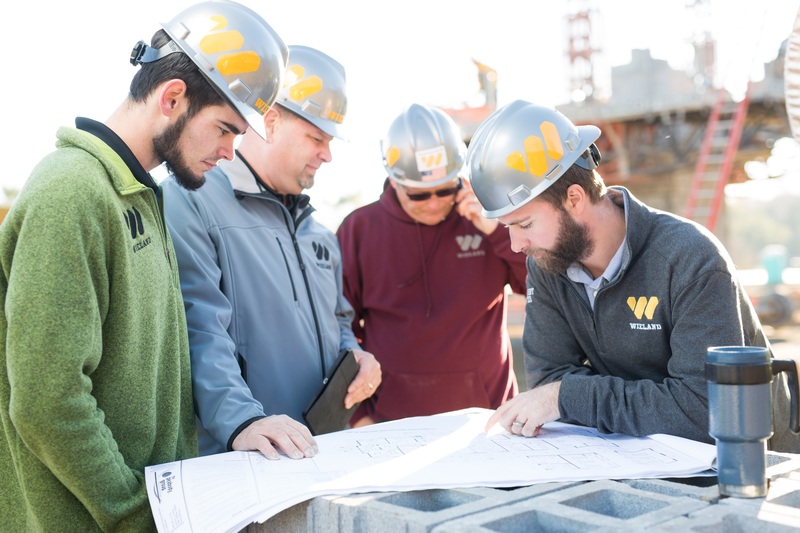 We have a supportive atmosphere that offers real opportunity, achievement, recognition and future advancement that makes Wieland a great place to work. We are committed to superior construction management processes and strive to deliver great buildings in a safe, timely and environmentally responsible manner. While we are continuously looking for talented people who possess a wide range of construction expertise, we are always accepting applications for a few positions including: Project Manager, Assistant Project Manager and Project Superintendent, regardless of job availability. Wieland’s medical health insurance is with Blue Cross/Blue Shield of Michigan. Our offering is a PPO Plan that offers an extensive range of in-network providers across the nation for all employees and their dependents. Our plan includes a three-tier retail copayment prescription drug card. Mail order pharmacy services are also available. Our dental plan is provided by Guardian-DentalGuard Pref NAP coverage. It includes 100% coverage for preventative services, 80% coverage for basic services and 50% coverage for major services. Maximum annual benefit is $1,000 per year per covered person. Our optical plan is provided by MetLife and includes co-payment for exams, in network allowances for frames/contacts at pre-stated frequencies. Reimbursement Accounts, also known as Flexible Spending Accounts, enable you to set aside a predetermined dollar amount in an account to cover eligible out-of-pocket health care or dependent care expenses throughout the year. IRS rules allow you to contribute to your account(s) through payroll deduction on a pre-tax basis. Then, as needed, you can withdraw funds from your account(s) to reimburse yourself for the eligible expenses you’ve paid. This coverage helps to protect your income if you become disabled because of a sickness or injury. This benefit will help you and your family meet your day-to-day living expenses by providing guaranteed monthly income benefits equal to 60% of your basic monthly income to a maximum of $5,000 per month. Group life insurance is provided by MetLife based on your salary. Death/Dismemberment provides twice the coverage. Employees may elect to purchase additional life insurance on themselves and their family members at pre-established rates and terms while employed. We offer a comprehensive 401(k) savings plan with a 25% employer match on employee contributions. Our plan offers a variety of investment options including fully self managed portfolios, roth options, and risk based portfolios. These accounts allow employees to pay for health care and dependent care related expenses that are not covered under your insurance programs. Your annual election will be withheld from your paycheck on a pre-tax basis. You will be provided a benny card for qualified expenses eligible based on IRS regulations. Personal Time Off (PTO) is available for all employees and will be pro-rated for your first calendar year of service then awarded at pre-set levels based on years of service. Six holidays plus the day after Thanksgiving are observed: New Year’s Day, Memorial Day, Independence Day, Labor Day, Thanksgiving, and Christmas. Bonuses are considered annually for all employees based on corporate profitability, personal contribution, and project performance. Amounts are discretionary and determined by management. The Company pays moving expenses and incentives to employees who relocate. Wieland is committed to the professional development of our employees and provide monthly in-house training opportunities on a wide range of work and personal issues. Tuition assistance will be awarded on a pre-approved basis for eligible employees. Some of the benefit plans listed above have eligibility rules and have a waiting period prior to eligibility. There is also a 30-hour work week minimum requirement to be eligible for most benefits. We are an equal opportunity employer that does not discriminate. We take all reasonable steps to protect the right of every employee to work in an environment free of intimidation and harassment. Assist in providing overall onsite management for the safe and timely completion of the construction project, while effectively communicating with the Wieland Project Team, and subcontractors. Provide support for the overall direction, completion and financial outcome of a project, while mentoring and guiding the project staff. Provide overall onsite management for the safe and timely completion of the construction project, while maintaining the project budget. Effectively communicate with the Project Team, Subcontractors, Design Team and Owners.